Where have I been? Seriously….1945 and I’ve never even heard about this book. 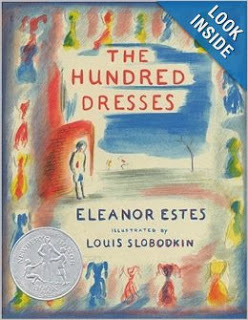 I love my daughter’s second grade teacher; her class book group has introduced me to a couple of great books, and this is one of them. And it’s timeless. Bullying is still an issue today. I felt so bad for Wanda because she had so much conviction each time she said she had 100 dresses all lined up in her closet. She would even bring it up. I asked my daughter as we were reading it why she thought Wanda would always bring it up, and she didn’t have an answer. Why bring up something that the other girls will bully you for? I loved the surprise at the end that answers this question. I love how it all comes together, and I love that Wanda was telling the truth! The descriptions of the other girls are perfect. I have been listening to the girls at my kids’ school, and although I haven’t heard any bullying, their voices and attitudes sound about the same as the girls in the book. This book is written well. The descriptions are right-on, along with the feelings and attitudes of the teacher and students. I love Maddie. I love that she recognizes the girls’ behavior as terrible. I wish she would have stood up for Wanda in the moment, but it is her internal torment that teaches the lesson in the book. It is her conscience that allows the reader to see the consequences of bullying; both to the child being bullied and to the bully. She may never be able to go back and fix the situation with Wanda, but she can definitely make a difference in the future. This is a wonderful story that is full of life lessons. It was a great opportunity for my daughter and I to discuss the issue of bullying in a safe and comfortable way. Reading this story allowed my second grader to see the consequences of bullying without me (or her teacher) just preaching to her. My daughter could read most of the story herself, although it was fairly difficult for her. There are some really good vocabulary words that were a little more difficult to read: incredulously, stolidly, arithmetic, exquisite, deliberately, and I’m glad I read it with her to help her with those words. It was also a really good way to discuss the issues. I highly recommend reading it with your child. I definitely recommend every second/third grade girl reading this book. Let’s stop bullying while these girls are still fairly little. Recommendation: Second grade and up as a silent read, and K and up as a read-aloud. This review was originally posted on 11/21/13.